We may now return to the subject of the initiation itself. Besides my work of proclaiming the Law to the profane and expounding it to the aspirant, I was set the task of analysing it in such a way as to illuminate the most advanced. During most of the winter I gave most of my spare time to the creation of literature which corresponded nobly with this three fold labour. I wrote the twelve stories Simon Iff in America. These were a continuation of the previous The Scrutinies of Simon Iff, but constructed for the most part on mere mechanical principles. I may even compare them to chess problems. The general method was to think of a situation as inexplicable as possible, then to stop up all chinks with putty, and having satisfied myself that no explanation was possible, to make a further effort and find one. I find it hard to consider this sort of thing as serious literature, and yet so ineradicable is the artistic instinct in me that the Old Adam peeps out sufficiently often to remove these stories from the category of jeux d'esprit. In particular, the story “Suffer the Little Children”, whose setting is in Florida as I knew it, flames so fiercely with the passion excited in me by the conditions which I found there, a passion which I cannot fairly describe as pity, scorn, disgust, indignation, or even any combination of these, that I believe this tale may stand like the broken statue of Osymandias, in the eyes of a new civilization, as a witness of the tyranny and abomination which Christians have taught us to associate with the name of Christ. It is at least an extremely accurate study of life in Florida; the accuracy is guaranteed by the acuteness of the suffering of the observer. One does not see children vivisected before one's eyes without receiving an impression, and the emotion which in ordinary cases might obfuscate and mislead the looker-on was in my case transformed into an ideal stimulant of clear-sightedness. I felt intensely that I had to have all my wits about me in order to expose the atrocity of the abominations which I was compelled to witness. The brilliance of the story is striking evidence of the fierceness of my reaction against the conditions of the backwoods life of the United States. One of the chief reasons for the inexpressible intensity of my feeling is doubtless that the nameless tortures which I saw inflicted as a mere matter of routine upon women and children as such broke open the sepulchre in which I had long since buried my own sufferings at the hands of Evangelicalism and released these fetid, noxious and malignant spectres once more to prey upon my mind. The above remarks may appear strange as a preliminary to the statement that I regarded and still regard this book The Sandal as essentially an exercise in technique undertaken in order to fit myself to write //Liber Aleph, The Book of Wisdom or Folly//, which is beyond question a consummate masterpiece in its particular sphere in literature. It has always been my custom to practise with a rapier very thoroughly before fighting a duel. If occasionally these friendly bouts have resulted in a few deaths — the more the merrier! The content of the above passage, properly analysed, should serve as an immensely valuable indication of the methods employed by my mind. Note in particular my reliance on obscure allusion. The remark about spelling expects the reader to be instantly reminded of the story of the “Something … Marquis of Queensberry” who, receiving the sympathetic condolences of a friend on having been mixed up with the trial of Oscar Wilde, replied that he regretted only one thing about the whole case; which was that on the libellous card, handed by him to the porter of the club, to be given to Oscar Wilde, he had spelt the word sodomite with two “d's”. years — but even if the central heating had been the flames of hell itself, I doubt whether I should have been warm. Night after night I sat, all through, rigid as a corpse, and icier; the whole of my life concentrated in two spots; the small section of my brain which was occupied in the work, and my right wrist and fingers. I remember with absolute clearness that my consciousness appeared to start from a perfectly dead forearm. The book is written in prose, yet there is a formal circumscription more imminent than anything which would have been possible in poetry. I limited myself by making a point of dealing thoroughly with a given subject in a single page. It was an acute agony, similar to that of Asana, to write, and the effort removed me so far from normal human consciousness that there was something indicibly ghastly in its unnaturalness when I got into bed in full daylight in the hope of acquiring a particle of warmth from the complacent Camel. I may now deal thoroughly with the complex and astounding incident which I promised to describe above. The Camel was a doctor of pharmacy, employed in pathological analysis, and later in manufacturing perfumery. She had never had any interest in Magick or any similar study, and I had not attempted to rouse it. One weekend she was lying on a mattress on the floor smoking opium, the apparatus having been lent us by a famous chiropractor who had bought it during a trip to Cuba, out of curiosity. I was sitting at my desk, working. To my surprised annoyance, the Camel suddenly began to have visions. I shut off my hearing in the way I have learnt to do; but after some five minutes babbling she pierced my defences by some remark concerning an egg under a palm tree. This aroused me instantly, for the last instruction given to myself and Soror Virakam was to go to the desert and look for just that thing. I saw then a kind of continuity between those visions and these. It was as if the intelligence communicating were taking up the story at the point at which it had been dropped. Of course, it might have been a mere coincidence. But that point could be easily settled by cross-examination. I began to ask questions. The Camel said that someone, whom she called “the Wizard”, wished to communicate with me. I am not a spiritualist who accepts any message as of divine origin. I insist on knowing with whom I am talking, and on his showing such qualities of mind that the communication will benefit me. ideal test of the integrity and capacity of the Camel's Wizard. I flung the question in his face. “If you possess the superior knowledge which you claim, you can tell me how to spell Baphomet!” The Camel knew nothing of the Hebrew and little of the Greek. She had no idea that a conventional system existed by which one could check the accuracy of any given orthography. Her Wizard answered my question without hesitation. “Wrong,” said I, “there must be eight letters.” “True,” he answered, “there is an R at the end.” The answer struck me in the midriff. One theory of the name is that it represents the words Beta alpha phi eta mu eta tau epsilon omicron sigma , the baptism of wisdom; another, that it is a corruption of a title meaning “Father Mithras”. Needless to say, the suffix R supported the latter theory. I added up the word as spelt by the Wizard. It totalled 729. This number had never appeared in my Cabbalistic working and therefore meant nothing to me. It however justified itself as being the cube of nine. The word chi eta phi alpha sigma ,1 the mystic title given by Christ to Peter as the cornerstone of the Church, has this same value. So far, the Wizard had shown great qualities! He had cleared up the etymological problem and shown why the Templars should have given the name Baphomet to their so-called idol. Baphomet was Father Mithras, the cubical stone which was the corner of the Temple. I therefore felt justified in concluding that the Wizard really possessed sufficient intelligence to make it worth my while to listen to him. I hastily recorded the dialogue to that point. My next question inquired his name. He replied “Amalantrah”. I added this up. This time the result was conclusive. Its value is 729. 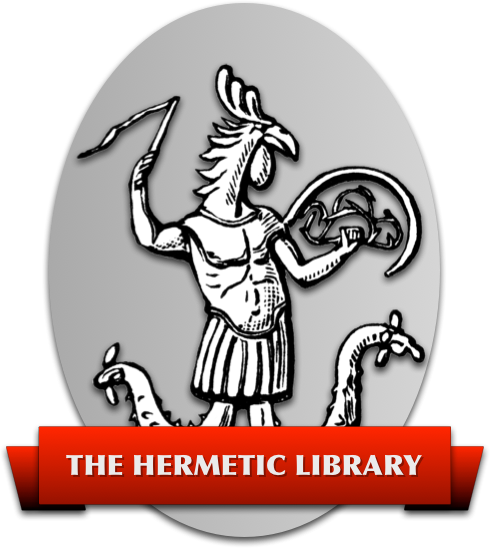 Already he had shown me that I, in my office as Baphomet, was the rock on which the New Temple should be built, and he now identified himself with me through his own name being of equivalent value. There was however so far no link between the Order to which he belonged and the Great Order; 729 is not a significant number in the Cabbala of Thelema. But when I asked him to assign a mystic name to the Camel, he replied “Ahitha” which adds to 555, an obvious correlative with my own number in the Great Order, 666. It defined, so to speak, the function of the Camel in that Order. Striking as were these results, I maintained my sceptical method and proceeded to apply test after test. The Wizard never made the slightest mistake. Taking his answers as a whole, he made it mathematically probably to a degree approximating certainty as closely as the most exact physical equations that he spoke with conscious knowledge. WEH note: Crowley obtains these totals by a complex mixture of Greek and Hebrew substitutions, including use of cognate letters. In simple Greek gematria, the total is very different. people. More especially there were three women, symbolized as three scorpions of the symbolic desert which I was crossing in my mystic journey. It is not yet clear whether I dealt with these women as I should have done. One was Eva Tanguay, the supreme artist, whom I hymned in the April International; one, a married woman, a Russian aristocrat in exile, and one, a maiden, to whom the Wizard gave the mystic name of Wesrun. This name can be spelt in two ways: one adding to 333, the number of Choronzon, Dispersion, Impotence and Death; the other to 888, the number of Redemption. It seemed that it was my task to save her as Parzifal saved Kundry. But as I say, I am not clear whether I did not fail completely in my dealings with all three women. I doubt whether I trusted the Wizard as I should have done. It may be that I made “a great miss”, the result of which has been to ruin my work temporarily. Besides this regular visit to the place where the Wizard lives, it was my custom to ask his aid in the solution of any problems which occurred in the course of my regular working. On the night of February 24th, I happened to want to know whether I could use my name in the Great Order, Tau Omicron Mu Epsilon Gamma Alpha Theta Eta Rho Iota Omicron Nu , (TO MEGA THPION), in conjunction with Hebrew letters. The Wizard replied, “Yes.” I asked, “Shall I use the whole name or Theta Eta Rho Iota Omicron Nu alone? He answered, “Theta Eta Rho Iota Omicron Nu alone.” I then spent some hours in trying to transliterate Theta Eta Rho Iota Omicron Nu into Hebrew in such a way as to give a number which would mean something in my general Cabbalistic scheme. I failed completely! This is very remarkable in itself, I having had twenty years' experience of the art, and the possible spellings being very numerous. Ingenuity can nearly always find a more or less satisfactory orthography for any given combination of letters. However, I was completely baffled. I gave it up as a bad job, cursing Amalantrah heartily for having made me waste my time. me that this could be done, a stranger in a distant town was actually writing the solution which baffled me. Observe that the preparation of this was the problem in my article “The Revival of Magick” published three months earlier! This incident in itself is sufficiently startling. On the theory that Amalantrah is what he claims to be it is quite natural and simple. Any other theory, such as coincidence, or telepathy outrages reason. But this was not all. Besides his Americanized signature “Samuel A. Jacob”, he gave his true name: “SHMUEL Bar AIWAZ bie YACKOU de SHERABAD”. I could hardly believe my eyes. Till that moment I had had no idea that Aiwass was anything but an artificial name, like Ahitha. I had tried to find a spelling for it, having never seen it written except in the English in The Book of the Law, but only heard it. I had decided on AIVAS = 78, the number of Mezla, the influence from the highest unity, and therefore suitable enough as the title of a messenger from Him. I wrote to Mr Jacob for the Hebrew spelling which he gave as OIVZ, whose value is 93. The import of this discovery was terrific; 93 is the value of Theta Epsilon Lambda Eta Mu Alpha , the Word of the Law proclaimed by Aiwass, and of Alpha Gamma Alpha Pi Eta , Love, part of the interpretation of Theta Epsilon Lambda Eta Mu Alpha . It was also that of the Lost Word of freemasonry, which I had re-discovered, thus linking up the mysteries of the O.T.O. with those of the A∴ A∴. 93 is also the number of the Secret Word of the Neophyte of A∴ A∴, a word indicating symbolically the whole course of existence. It is in fact a completion of the ideas contained in the Sacred Word of the Hindus, AUM. It was to be discovered later that the Secret Key of The Book of the Law is the number 31, 1/3 of 93. There are three words, each of the value of 31 which represent perfectly the whole mystery of existence. That Aiwaz should have, so to speak, signed himself with His Law, was irrefutable proof of his existence. I must add one cumulative proof which came to light only in 1923. The Book of the Law claims to express its ideas not by its literary meaning alone but by the actual letters of the manuscript. It had annoyed me — after the above demonstration — that in the manuscript the name was spelt AIWASS, which does not add to 93. But this year, reflecting that “The Book of the Law” is connected more with the Greek Cabbala than with the Hebrew, I transliterated AIWASS into Greek off-hand. Its value is 418! and this is the number of the Magical Formula of the Aeon. It represents the practice of the Book as 93 does the theory. It is now evident with what inconceivable ingenuity AIWAZ has arranged his expression. He is not content to give one spelling of his name, however potent; he gives two which taken together are not merely twice as significant as either alone, but more so, in a degree which is beyond me to calculate. thing that has ever happened to anybody. I was not only shown the knowledge and ingenuity required to choose a name for himself which will sum up my life and thought both in the past and in the future as also to include explanations of historical mysteries; but he seems able to arrange for people that I never hear of to exercise an intimate influence on my life at the exact moment when the effect will give the demonstration its highest possible dramatic value. Suppose, for instance, that Jacob had sent me his solution within a month of the publication of the problem. It would have been no more than an interesting contribution to the Cabbala. It is necessary to obtain a comprehensive idea of the facts of the relationship between him and myself as a whole in order to grasp the subtlety and strength of his plan and its execution. Any man who studies the circumstances with intelligence will be forced to the hypothesis as to the nature of AIWAZ which I myself entertain. It is true that this hypothesis involves difficulties of its own; it implies a magical theory of the universe altogether incompatible with materialism. One might call it an Arabian Nights theory. But one must dismiss one's prejudice from the start. This theory, however antecedently absurd, is constantly bearing fruit of new facts and new discoveries. This after all is what science requires. I have already given a number of other instances where fresh facts confirm the old. For myself in particular the ultimate fact is that I have been able to govern my life quite satisfactorily year after year on the basis of this theory. My life, interpreted by it, is intelligible, and when guided by it, successful. Whenever I do anything reasonable I come a cropper, and if I were to attempt to explain the events of my career in any other way, I should be confronted by a piled chaos of utterly unintelligible absurdities. The sale of The International left me stranded. War hysteria had reached its height. The British would not employ me, failing to understand or to trust. The Department of Justice, though warmly appreciative of my work, did not offer to pay me for it, nor did I ask them to do so. My stupid kingliness still stood in my way. I should have felt dishonoured by accepting payment for my patriotic service. All sources of income dried up completely. I therefore borrowed a canoe, tent and camp outfit from a friend and started up the Hudson on a Great Magical Retirement with two dollars and twenty-five cents as my total capital, no prospect of obtaining more when that was exhausted, and full confidence that the Secret Chiefs would supply my physical needs. It was my business to do their work and theirs to look after their servant. with Commentary, of the //Tao Teh King//. This book, one of the oldest in existence, is surely one of the wisest. But all previous translations, however scholarly, had completely failed to convey the meaning of Lao Tzu. An uninitiated translator is bound to meet constantly with apparently nonsensical passages. One must know what the author is likely to mean by any given phrase, and this can only be done my a man who has intimate experience of the spiritual states and magical principles set forth. Otherwise, the translator is in the position of a scholar ignorant of football who should try to translate some slangy description of a cup tie. He will think that “wing” has something to do with a bird and be puzzled as to how it got into the game; a “hot shot” will set him thinking of the siege of Gibraltar, and the result of his labours will be a farrago of nonsense. Alternatively, realizing the general character of the text, he will wrench every passage to suit his own ideas on the subject. No one has understood what Lao Tzu meant by either Tao or Teh. I, possessing the keys to the Universal Cabbala, and also experience of the spiritual states which Lao Tzu is discussing, was able to produce a lucid and coherent version of the classic. Those who have seen my manuscript after bitter disappointment with previous translations, have instantly recognized the sublimity and wisdom of the Chinese Master.